And if your eye cause you to stumble, tear it out; it is better for you to enter the kingdom of God with one eye than to have two eyes and be thrown into hell. I was sitting in a classroom at James Madison University when one of my peers raised her hand to ask a question. The lecture had been focused on the reliability of the New Testament writers/witnesses and a debate had erupted over whether or not to take the bible literally. I sat patiently near the front of the class watching the comments fling back and forth like a ping pong match between the students and our professor when the girl finally raised her hand. I don’t remember the girl’s name, but I will never forget the way she looked as she slumped back down into her chair thinking about what our professor had said. The bible is full of different literary forms that give it life. There are epic poems that retell the great story of the past in order to teach a lesson to the present. There are long genealogies that connect different characters throughout the centuries. There are parables of everyday situations that are meant to leave us scratching our heads in wonder. There are metaphors used (just like we do) to convey meaning in a way that is memorable and effective. There are proverbs, psalms, and poems that contain wisdom beyond their literal words. The bible is not a historical narrative to be analyzed and redacted like a modern textbook. It is not a perfect collection of rules to live life. The bible is not a text to be read literally all the time in every situation; otherwise we would all be stumbling around with missing appendages. The great beauty of scripture is that it opens up the strange new world of what it means to be in relationship with God and with our fellow human beings. 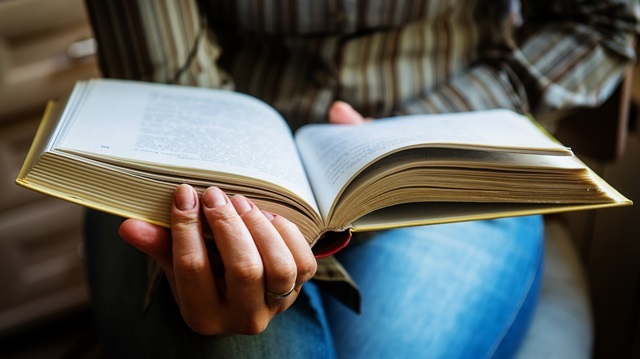 The greatest moments in our lives cannot be conveyed in simple words to be taken literally, but are in fact so profound that we must use differing literary forms to even begin conveying what our experience was like. The bible is full of wonder and that’s why we keep coming back to it every day and every week to learn more about who we are, and whose we are. This week, let us open up our bibles to discover the strange new world of God’s kingdom, and start letting it become incarnate in the way we live. Have you not known? Have you not heard? Has it not been told you from the beginning? Have you not understood from the foundations of the earth? It is he who sits above the circle of the earth, and its inhabitants are like grasshoppers; who stretches out the heavens like a curtain, and spreads them like a tent to live in; who brings princes to naught, and makes the rulers of the earth as nothing. Scarcely are they planted, scarcely sown, scarcely has their stem take root in the earth, when he blows upon them, and they wither, and the tempest carries them off like stubble. To whom then will you compare me, or who is my equal? says the Holy One. Lift up your eyes on high and see: Who created these? He who brings out their host and numbers them, calling them all by name; because he is great in strength, mighty in power, not one is missing. Why do you say, O Jacob, and speak, O Israel, “My way is hidden from the Lord, and my right is disregarded by my God”? Have you not known? Have you not heard? The Lord is the everlasting God, the Creator of the ends of the earth. 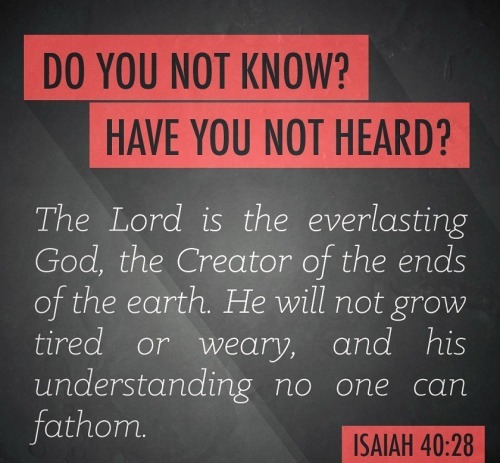 He does not faint or grow weary; his understanding is unsearchable. He gives power to the faint, and strengthens the powerless. 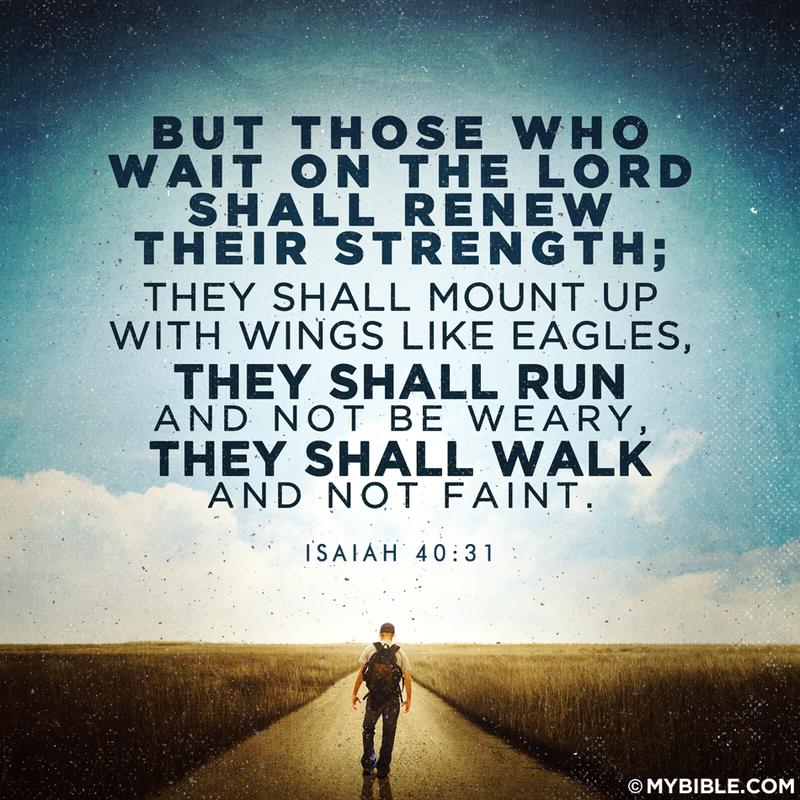 Even youths will faint and be weary, and the young will fall exhausted; but those who wait for the Lord shall renew their strength, they shall mount up with wings like eagles, they shall run and not be weary, they shall walk and not faint. I have witnessed, read, and heard lots of sermons. From as far back as I can remember I was in church on a regular basis listening to people like me stand at the front of church and talk all about the bible. During seminary, I learned about the importance of attending different churches to hear from a variety of preachers. Listening to different pastors helped to cultivate my own sermonic style, and show me what not to do. There was a time where I heard a young woman preach on the sacrifice of Isaac from Genesis. As a sweet and endearing theologian, she frightened everyone in the room by continuing to beat on the pulpit in rhythm; first the rhythm of Abraham’s heart as he pondered the fact that God called him to sacrifice his son, second the rhythm of Abraham’s axe falling on the wood to prepare for the fire, and then latter the frightening sound of the blade falling in Abraham’s imagination. It shook everyone to their cores. Right before I was appointed here at St. John’s I heard a pastor from the Eastern Shore preach a sermon on one of the psalms. He stood up before the gathered body and explained that he had felt convicted by the Spirit that week to rewrite the psalm as if he was one of those slam poets, and then proceeded to perform his new rendition for all of us. I can’t remember precisely what he said, but it sounded like this: “My heart beats beats beats, O God my heart beats beats beats. I will sing along to the beat, and make the beat my melody. Awake to the rhythm of my heart beat beat beat. Give thanks for the beating heating sleeting of my heart. For his steadfast love, is like a perfect dove, in the heavens so high, up in the air where the birds fly. Listen to the beat beat beat…” He went on like that for twenty minutes. Sermons, at their best, make the Word incarnate again so that we can live it out in the world. There are as many styles as there are preachers, but hopefully we all ground what we say in God’s Holy Word. A common rule of thumb for preaching is that the text from scripture should determine the style of sermon. For instance: If the scripture lesson is a letter from Paul to one of the early churches, the sermons should function in a similar way to the church that is listening. If the scripture is a narrative, then a story should be used to help reveal the Good News from the text. If the passage is a parable, then the sermon should leave the people scratching their heads in the same way that the first Christians probably did when Jesus said something like the kingdom of God is like a mustard seed. Our scripture today, though from a prophet, is a poem. The Babylonians had scattered the Israelites throughout the region and they feared for their existence. They continued to grumble about their situations and constantly blamed God for their misfortunes. Like Jesus praying before his crucifixion, the exile was their Garden of Gethsemane, in which they would pray for the cup to pass from them. Instead of telling a harrowing tale from Israel’s past, instead of offering a parable about their situation, Isaiah speaks into their situation as a poet. It is now my challenge to do the same. Have you not known? Have you not heard? Have you not read about this in your bibles? Have you not experienced it in worship and in your daily prayers? Has it not been told to you week after week since the very beginning of your faithful journeys? God is the one who sits above all things, He is the one who reigns over us. All of us, the people and inhabitants of the earth, we are like insects who come and go. God is the author of salvation, he has opened up creation for us, dwells besides us, and hopes with us. God is the one who tears governments down, and makes the rulers of the earth fall away like leaves in autumn. Like flowers in a field they are rarely planted, their roots descend but to not take hold, and when God blows upon them they float away. Crops come and go like the seasons, new plants reach up to the heavens only to disappear, flowers bloom only to wither, but God remains everlasting. To what, then, shall we compare the Holy One? What kind of associations, experimentations, delineations shall we use to understand the one on high? What kind of metaphor will bring God to light? What kind of story points to his glory? Look around you at the people in your life, at the blessings of food, function, and faith, at the wonders of God’s creation. God is the author of salvation, the teller of your tale, the sower of your seeds. He brings about life for all creatures then and now. It is only because of God’s great strength and glory that not one thing is missing from your story. So, people of God, why do we say and believe that “God does not care about my life!” How can we even utter such an abominable accusation about the author of salvation? The Lord is the everlasting God, the creator of the ends of the earth. Strength will rise as we wait upon the Lord as we wait upon the Lord as we wait upon the Lord. Our God reigns forever, our hope, our strong deliverer. He will not faint. He will not grow weary. His understanding is unknowable. The Lord is the everlasting God. He gives strength to those who are weak, he empowers the powerless, and loves the unlovable. When we look out and see destruction, God sees incarnation. When we experience death, God sees life. When we believe God is missing, He is the one carrying us through our shadow of darkness. Even the young people, with their strength and vision for the future, they will fall and be weary. The people in church and society that we so admire will crumble. They believe that life is a sprint instead of a marathon. But those who wait for the Lord, those who believe in the power of patience, shall have their strength renewed. 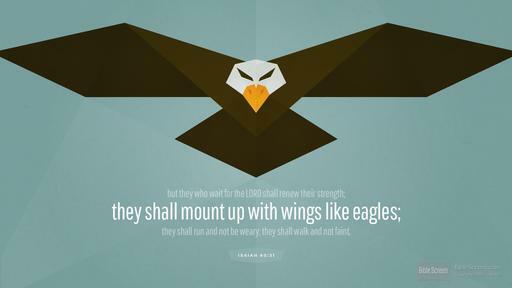 They shall mount up with wings like eagles, they shall soar from the highest of heights, they shall run and not be weary, they shall walk and not faint. If you can’t fly, then run. If you can’t run, then walk. If you can’t walk, then crawl. If you can’t crawl then pray and pray and pray. But whatever you do you have to keep moving forward. The Lord is the everlasting God. Believing is greater than understanding. I’m not talking about the simple belief that God exists, I’m not talking about believing in God. I’m talking about believing God. Believing that He is everlasting, that he creates and commands that stars in the sky, and hopes for us when all things feel hopeless. The captives were afraid that what they held so dear would disappear to the sands of time. Many of us fear the same thing about what we believe is precious: values, morality, ethics, the church, society, love, hope, patience. But why should we be frightened? God the everlasting remains when all others things are swept away. Kings will reign, politicians will run for office, we will live, grow, and die, but God is the one who remains. We are so tempted to get caught up in the here and now that we are unable to see things from God’s perspective. Our humanity prevents us from seeing God’s divinity. We look around and see all the failures of life around us and we fling our “why?” at God; but we should first challenge ourselves. What can I do to make this world better? How can I serve the needs of my brothers and sisters? What can I do to help show people a little glimpse of heaven on earth? To wait for the Lord requires patience. We will all spend so much of our lives in vain trying to understand all that God has done when all we are called to do is believe. “What is the text saying?” My professor asked of our class. We had our bibles open to the corresponding verses and began to argue about what it meant. Some people, who desperately liked hearing the sound of their own voices, waxed lyrical about the historicity of the text and mentioned elements like fragments of papyrus and the corresponding dates of discovery. Some people, who were more evangelical than others, went on and on about the infallibility of God’s Word and declared that we must take every single word literally and live them out. Some people, who clearly were not paying attention, skirted around the issues in the text and talked about broad subjects so as to make it appear as if they had done their reading, when in fact everyone could tell they had not. This poem from Isaiah is a humbling reminder that we are not nearly as important as we think we are. We are not the center of the universe. We can strive to work as hard as we can for our church and our community, but ultimately God is the one who brings about true transformation here on earth. What we pray for and work toward is worthy of our time, we just have to learn to trust that God will bring it about according to his will. Only an everlasting God could have the patience necessary to see the world turned upside down. We are people of faith. We are people of belief. Let us not give in to the temptations of the world’s expectations of immediate gratification, and instead believe that God is the everlasting perfecter of patience, now and forever. Amen.